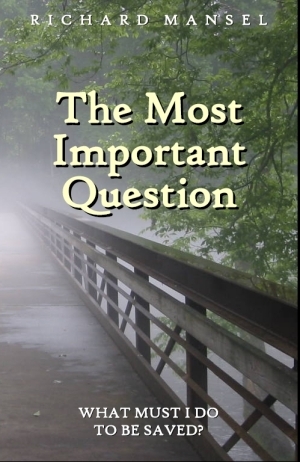 Forthright Press’ newest release: The Most Important Question: What Must I Do to Be Saved?, by Richard Mansel. Richard explores in clear language the answer from the Bible about what is necessary for every person’s salvation. From descriptions of our need, to the work of the cross and our response, the 26 concise chapters trace the path of faith. With discussion questions at the end of every chapter, the book is an ideal study guide for individuals and small groups. Subtitle: What Must I Do to Be Saved? Richard is the preacher of the Church of Christ in Allenhurst, Ga. He has preached full-time since 1995, after several years in education and retail. From Freed-Hardeman and Southern Christian Universities he obtained Masters degrees in Ministry and Divinity. He has been writing for many years. He is married to Deirdre, and they have two daughters, Chelsea and Sarah. Richard gave a newspaper interview about the book March 19, 2009. Read it here. Retail price of this 112-page book is $6.95. Or payment may be made by PayPal to Barbara Oliver, email ba@oliver.net. This entry was posted in Books and tagged Books, grace, obedience, redemption, salvation on 2011-04-15 by J. Randal Matheny.